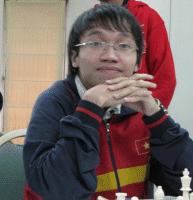 GM Nguyen Ngoc Truong Son (pic from gilachess) is the new KL Open champion with 7.5 point.He win again Ismail Ahmad, Tolentino Rustum, IM Liu Dede, CM Farid Firman Syah, FM Mahmud Syarif, Dzhumaev Marat and drew with IM Tirto, IM Irwanto Sadikin, GM Thien Hai Dao. Congratulation for all the winner. Only 7 player from Malaysia take part and this statistic very bad for chess in Malaysia. Maybe all other Malaysia players has their own commitment.